Pat fell in love with art in 5th grade, and had great art experiences in her suburban Chicago schools. She was an art major art Cornell College in Iowa, which led her to becoming a graphic designer in Chicago for 15 years. (not easy for a female in those “Mad Men” days). She has studied at the Art Institute of Chicago, the Old Town Art Center and the American Academy of Art in Chicago, and with New England and Chicago watercolorists including Fred Messersmith, Charles Reid and Irving Shapiro. She retired from advertising after the birth of her first child and returned to watercolor painting. She has juried numerous exhibitions in the Chicago area and Sarasota, Florida as well as exhibiting in those places. She taught Adult Watercolor at the Kaleidoscope School of Art in Barrington, Illinois. She also does house portraits. 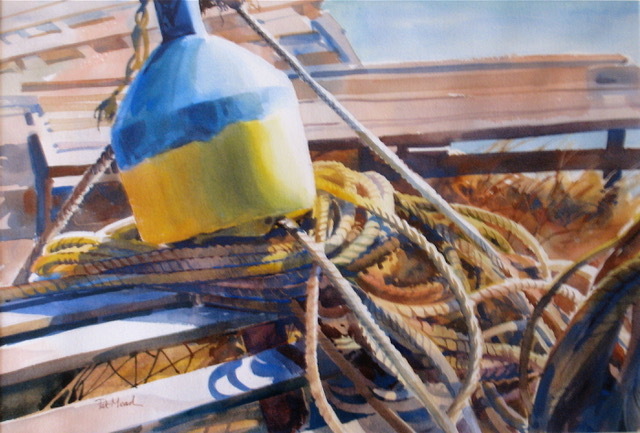 She is a signature member of the American Watercolor Society and the Transparent Watercolor Society of America, and has received numerous awards including First Place Award in a National Watercolor Society All Member Show.